Patello-femoral pain is pain around the kneecap (often on the inside or outside of the kneecap). It's usually the result of excessively intense or repeated, prolonged training. 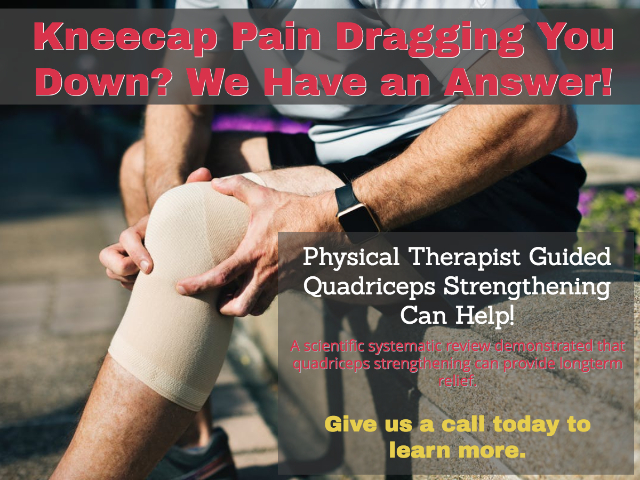 The good news is physical therapy can help. Multiple research studies conducted by scientists have proven that physical therapy can help with this condition. If you or someone you know has pain around your knee, give us a call. Chances are we can help. ACL injury or anterior cruciate ligament tears are serious knee injuries. It was once thought that the only way someone could function or even return to sports was with surgery. That's not the case. While surgery is necessary in many cases, a number of high-level athletes and non-athletes do just fine without surgery. 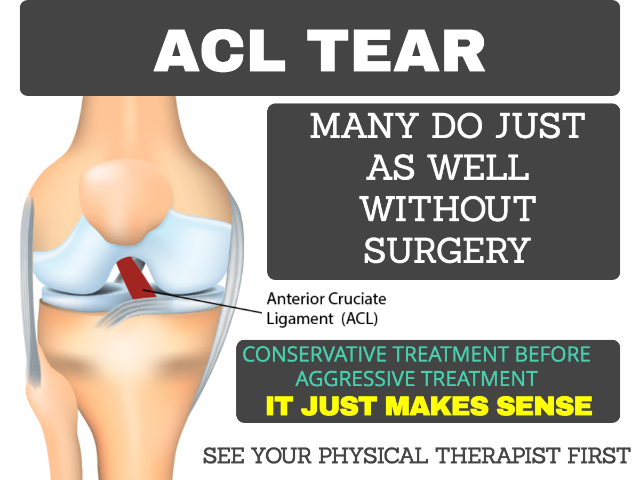 So, if you have an ACL tear, think about conservative, natural treatment first provided by a physical therapist. If that doesn't work, you may require surgery. 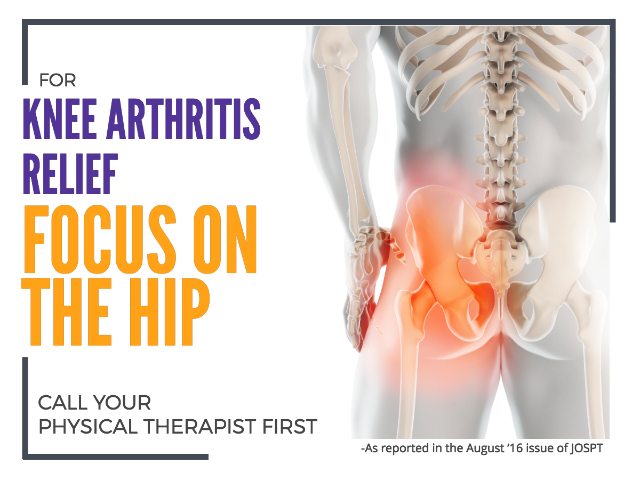 If you have knee osteoarthritis, you should see a physical therapist first. Surgery for knee osteoarthritis should be the last option. Clinical research conclusions are consistent - a physical therapist directed exercise program is effective for many. A degenerative meniscus tear was once thought to be a condition that would only resolve with surgery. 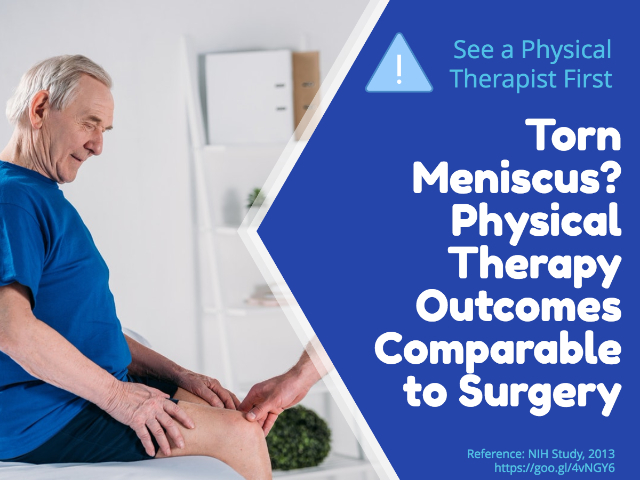 Scientists have concluded that patients with knee arthritis and meniscus tears don't necessarily need surgery. The first option should be physical therapy. If that fails, then surgery is a possibility.